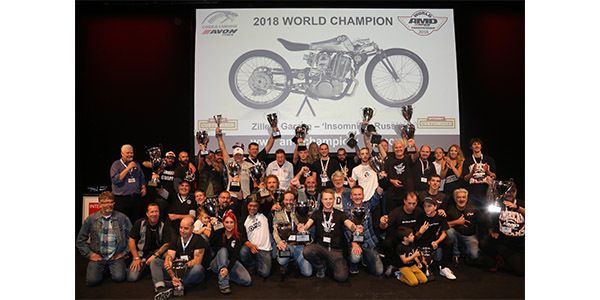 Russian customizer, Zillers Garage, scored a convincing first place in the 13th annual AMD World Championship of Custom Bike Building at INTERMOT Customized in Cologne, Germany, on Oct. 7. With “Insomnia,” Zillers’ Yamaha SR 400 based masterpiece, rising star Dmitry Golubchikov takes the coveted title of Avon World Champion of Custom Bike Building for the next two years, and became the first winner of the AMD World Championship from Eastern Europe. In a very broad international spread of top honors, second place and first reserve champion went to Omar Jumiran, all the way from Malaysia for BoneX, his exquisite hand built, race-inspired AJS 350 engined drag style one-off special. Jumiran qualified to compete at the AMD World Championship as a result of his win at MotoNation, Kuala Lumpur in 2017, one of the international network of AMD’s official affiliate custom bike shows. Third place and second reserve champion went to Károly Orkonyi from Hungary for Speedster King, his futuristic 1700 cc handmade rigid. Fourth place went to Pavel Malanik from the Czech Republic for Beast of Brooklands, a handmade one-off replica of what itself was a handmade one-off JAP engined racer, of over a century ago, that was built by North London Garage in England to hold the then World Landspeed record. Fifth place was taken by 2013 AMD World Champions Don Cronin and Mick O’Shea of Medaza Cycles (Ireland) with Stechmücke, a remarkable re-imagining of a 1981 MZ250 – complete with 1920s art deco streamliner styling. In total, 98 bikes competed at this year’s AMD World Championship, entered by 85 individual competitors from 30 different countries including as far afield as the United States, Japan, Taiwan, South Korea, Indonesia and India. The ever-popular Modified Harley-Davidson World Championship was won by Julian von Oheimb of One Way Machine with Silver Storm, a 1450 cc 2001 Softail Deuce. Also flying the flag for Italy, the Cafe Racer class was won by FMW Motorcycles with Hurakan, an S&S Superstock Avon Tyre-shod 1968 Shovelhead. In the demanding Street Performance class, the win was taken by Paul Milbourn of the United Kingdom with Titanium V – an 1100 cc Moto Guzzi weighing in at just 155 kg. Staged as the lead feature at INTERMOT Customized, the AMD World Championship was widely praised by exhibitors and visitors alike as delivering an inspirational and aspirational show environment that champions the outstanding craftsmanship and innovation of the international custom motorcycle market. The 14th AMD World Championship will be staged at INTERMOT Customized at the Cologne Exhibition Center in October 2020.